L-R) Katherine Todd Brown, Janet Jansson and Vanessa Bailey are participating in today's workshop – on World Soil Day – at the National Academy of Sciences. 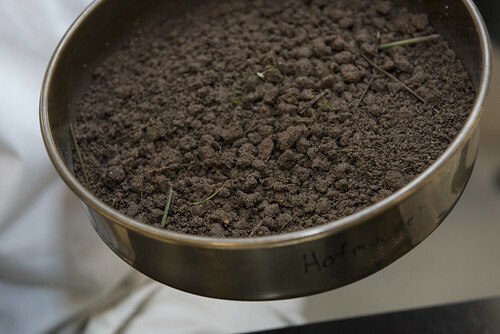 Soil under scrutiny at PNNL. RICHLAND, Wash. — The Earth's soil is a very active but poorly understood ecosystem right beneath our feet. The Department of Energy's Pacific Northwest National Laboratory has two ongoing research efforts exploring the properties of this important — but oft-overlooked — system. The research, involving a range of diverse projects looking at soil's role in Earth's climate, the environment, food and fuel production, supports today's announcement by the White House of a framework for Federal soil science to maintain and create healthy soils. The White House announcement comes on the same day that the National Academy of Sciences puts its focus on soil. 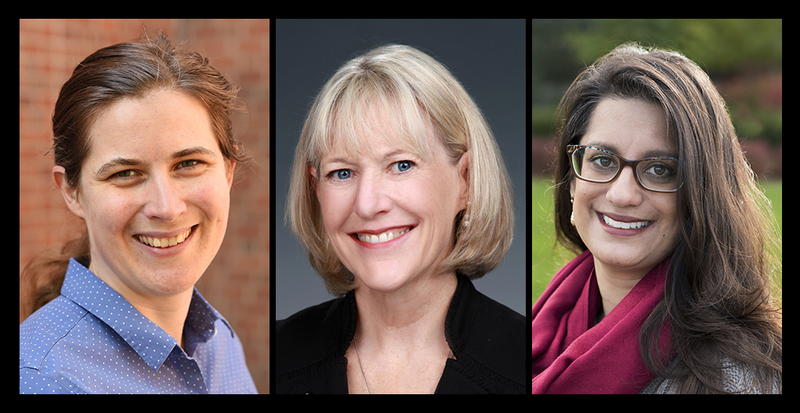 The academy's workshop, "Soils: The Foundation of Life," attracted scientists from around the nation, including PNNL's Vanessa Bailey, Janet Jansson and Kathe Todd-Brown. Participants are discussing soil in relation to national security, climate, food security, biodiversity and other issues. The two soil-related PNNL efforts, known as MinT and IPASS, are internally funded by the laboratory through its Laboratory Directed Research and Development program. Through the two PNNL initiatives, approximately $20 million supports research related to soil — a critical ecosystem resource that makes food and bioenergy crop production possible, influences the quality of the air we breathe, and has a broad impact on climate. These projects are in addition to several other soil-related research studies at PNNL funded by the Department of Energy Office of Science. In the MinT initiative, more than two dozen PNNL researchers are focusing on the role of microbes in soil, climate, health and the environment. In soil, microorganisms living in communities known collectively as microbiomes perform most of the activity that occurs in soil, helping to determine plant health, crop productivity, how the land stores carbon, when and how carbon is released into the environment, and the fate of contaminants and other compounds in the environment. Just a teaspoon of soil has tens of thousands of different microbial species present — an army of actors on which Earth depends for its future. The soil microbiome is crucial to understanding how plants take up nutrients and how crops sustain or develop resistance to conditions like drought. Three years remain on this research effort, which is led by Janet Jansson. In this four-year initiative launched earlier this year, 20 PNNL scientists are studying fundamental processes that affect the flow and transformation of carbon, nitrogen and water through the plant ecosystem. Soil, plants and the atmosphere are all important to the health and future of the planet, but many research efforts look at the components separately. The IPASS team is looking at the interactions between plants, microbes, the soil and the atmosphere as one — very complex — system, including the effects of genetic information in the plants and the effects of environmental factors including climate. Scientists will take an unprecedented look at the "rhizosphere," the area in soil surrounding a plant's roots. This root zone holds great sway over the climate. Plants take in carbon from the atmosphere and can send it through their roots into the soil, or they can shunt the carbon into their leaves and other structures. And once carbon is in plants and soil, its fate — mainly whether it enters the ecosystem or stays locked in the ground — depends on a number of factors. Understanding the factors that determine what happens to the load of carbon absorbed by plants and stored in the soil will help scientists plan for the future. IPASS is led by Christer Jansson, who has done extensive work deciphering the factors that underlie the growth of plants, particularly drought-resistant plants, which could be used as fuel or food. Earlier this year, Bailey and colleague Ben Bond-Lamberty showed that microbes in soil may not be as resilient as scientists have thought when it comes to climate change. Next week, at the annual meeting of the American Geophysical Union, Bailey will give an update on the fate of carbon in soil. Later this week she will host a Reddit "Ask Me Anything" session on the topic. Janet Jansson is helping scientists worldwide map out ways to expand our knowledge of microbes in soil. Last year she published findings in Nature that explore how the activity of microbes in permafrost will change with warmer temperatures. She is part of another White House effort, on the microbiome, and is a leader bringing together scientists from around the world to decide on next steps in research, including the technologies necessary for further discoveries. Todd-Brown is part of an international team that just last week published a paper in Nature showing that carbon stored in soil is expected to be released at an accelerating rate in the next few decades.